When the Christmas tree at centre stage of Cardiff's festive celebrations went up - it did not quite measure up to expectations. Cardiff council said it had ordered a pre-decorated 40m - or 131ft - "tree-shaped structure" from China for outside Cardiff Castle. But when the centre piece, costing £10,000 a year, went up on Friday night it was revealed to be just 40ft. The authority apologised to anyone who had been expecting "a bigger tree". A council spokeswoman confirmed the tree was 40ft not the 40m that had been advertised. "The person who told us the tree was 40m high has since revealed he believes he is 18ft tall," she said. "We apologise to everyone who was expecting a bigger tree and are cutting the person responsible down to size." Cardiff council had been criticised for not having a tree up in time for the Christmas lights switch-on as it was being shipped from China. 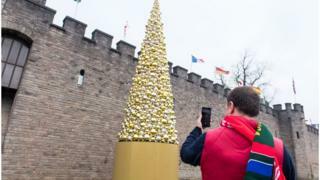 Costing £30,000 over a three year lease from UK-based company MK Illuminations, the structure arrived in Wales with all the golden baubles pre-attached. But the authority says the tree will save the tax payer £5,000 a year compared to previous "tree installations".